After back-to-back months of weak activity, volumes rose 6.8% at spot FX ECN, KCG Hotspot. For the month, average daily volumes (ADV) were $27.544B, compared to $25.873B in May. However, similar to other venues and brokers, 2014 activity is well below that of last year, with Hotspot’s June results 25.4% below the same period last year. For the quarter, ADV were 26.22B, 18.6% below Q1 2014, and 21.2% below the same period last year. 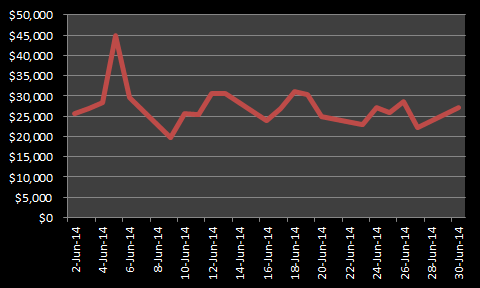 At Hotspot, June marks the first full month of daily volumes being published. During the month, volumes peaked on June 5th at nearly $45B as traders reacted to the month’s ECB Meeting and announcement of negative interest rates and increased monetary stimulus. However, as has been the case for 2014, the activity failed to build ongoing momentum, with Hotspot’s lowest day of volumes occurring two business days after the ECB announcement. More worrisome than just a decline of volumes, the lack of consistent activity may lead traders using cross asset strategies to decrease their involvement or exit outright from currencies.